Detailing the physical features, habits, territorial reach and other identifying qualities of the Banded Horntail. 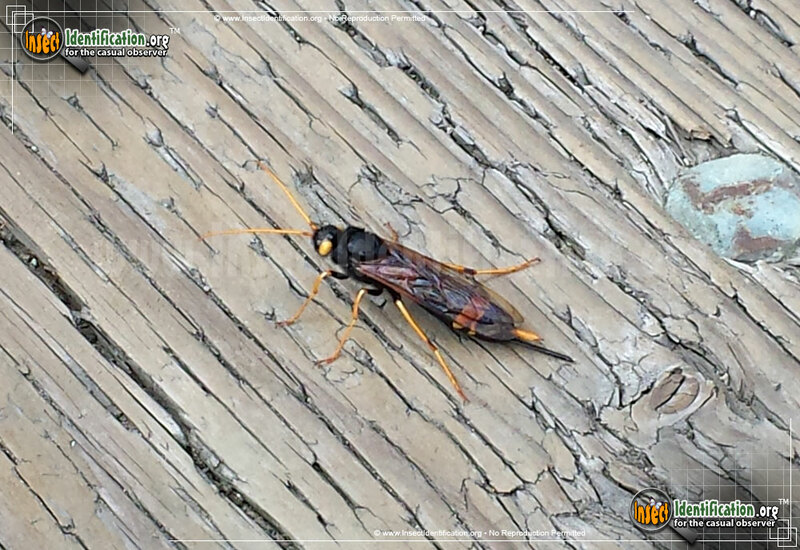 A Banded Horntail seems like its a mean wasp with a long, nasty stinger, but its looks don't do its passive nature justice. Though adults appear menacing to humans, Banded Horntails are not aggressive and do not sting nor bite. Long, tubular bodies have prominent yellow bands at the end of the abdomen. The alarm coloration is often the precursor to unnecessary panic thanks to the stiff 'horntail' at the tip of the abdomen. Females have what appear to be two 'stingers'. The longer, syringe-like one is actually an ovipositor. This strong organ is used to punch holes into hard tree trunks and then inject eggs into the wood. The hope is that burying the eggs deeper into wood will offer them more protection. The larvae of Banded Horntails have enemies. 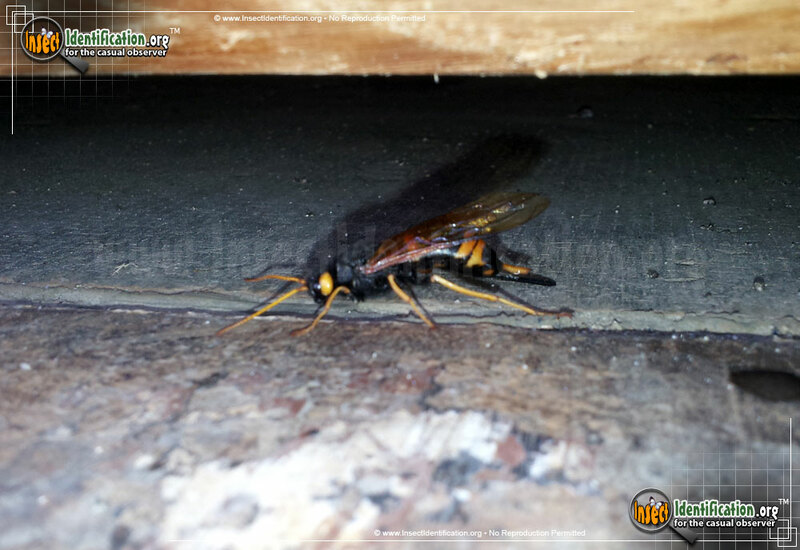 They are sought out and eaten by the growing larvae of other parasitic wasps that were laid on the same tree trunk. If the Horntail larvae survive the hunt, they will feed on the interior wood of the tree, tunneling through vascular tissue, and eventually emerge as adults. Males have been seen clustering together at high ground while they wait for females to come and mate with them. This behavior is called "hilltopping". Once they have mated, adult females work tirelessly, boring as many holes and laying as many eggs as they can before dying. Adults only live for about 3 to 4 weeks. In that short life span, a female can lay over 300 eggs, each in their own hole. The whole life of a Banded Horntail, from larva to adult, can last 3 years. Because this species prefers conifer trees like pine, it is not uncommon to see young adults indoors as they emerge from wood that was harvested years prior and used to build things (like furniture) while they were still developing larvae. The tunneling can impact the beauty of the wood, affecting its usability, so Horntails are generally considered a nuisance in the lumber industry.